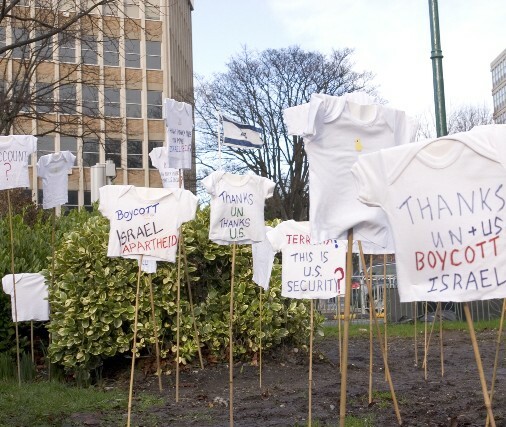 The artistic installation, by artist Tracy Walsh consisted of babies’ vests and tiny t-shirts placed on bamboo frames which were solemnly placed upright on the grassy ‘garden’ outside the Israeli Embassy. 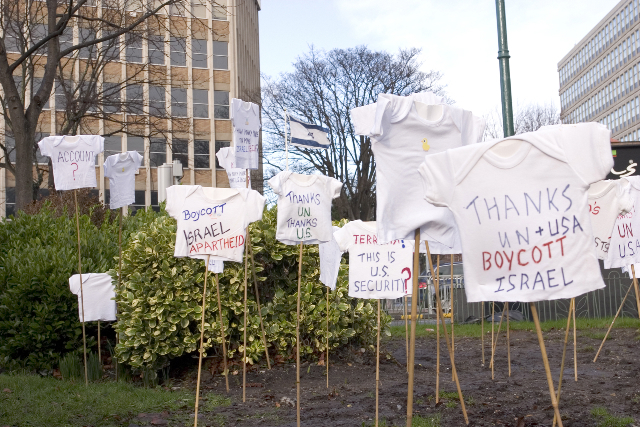 The vests, each bearing a message relating to Israel’s slaughter of Palestinian children, fluttered in the wind as musicians Steve Larkin and Eoin Dillon of Kila played a lament for the victims of the Israeli assault on Gaza. Many artists and members of the Irish arts community attended, including: Aisling O’Sullivan from the Clinic, Brendan Conroy and Donal O’Kelly from Kings artist and writer Gerard Mannix Flynn, Raymond Keane of Barabbas; as well as actors Neili Conroy, Glynis Casson and Sorcha Fox.